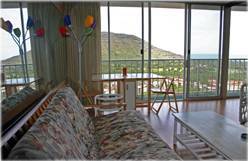 Oahu/Ocean/MountainView Makaha Valley Towers Unit 1213 ONLINE BOOKING NOW! the bed is large, comfy and inviting. provides a stunning panoramic view. peacock population add local color. Breathtaking views, acres of beautiful lush tropical landscaping and local peacock population. Waianae Boat Harbor is less than 5 miles from the Towers. 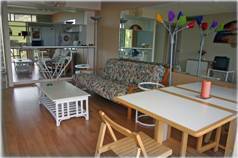 Hardwood floor, modern furniture with splashes of color make this a one of a kind unit. Looking out from the kitchen/bar area. Valley, Mountain and ocean view from the living room and bedroom. Looking Back towards the front door and the kitchen and bar area. Looking out over the pool, BBQ area and the valley & mountains beyond. 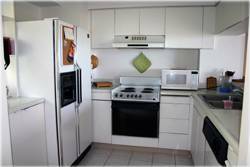 Bright, spacious and fully equipped kitchen. 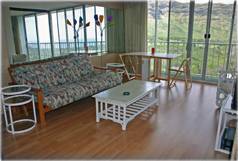 Intimate dining room with a view to rival any restaurant on Oahu. 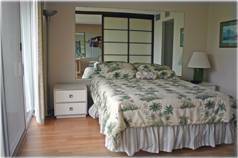 Tropical palm decor awaits you in this large, comfortable bedroom with a view.